Giant birds, fish, squid and many types of colourful balloon kites decorated the clear skies above Bukit Layang Layang, Pasir Gudang, the venue for the 19th Pasir Gudang World Kite Festival from Feb 19 to 23. Themed, Wind Garden, this year's kite fest was attended by 818 local participants and 232 foreigners who represent 39 nations. The warm and windy weather in Pasir Gudang cooperated with the organisers as thousands of kite enthusiasts, locals and tourists thronged the fest to admire the amazing kites and enjoy the carnival on the hill. Participants designed kites with twinkling lights for the second edition of the Night Kite Show following its successful inaugural event last year. Lighted kites from contest participants mingled with the bright kites flying in demonstration in a canopy of lights for the audience's entertainment. This kite festival will go down in history as the first Pasir Gudang World Kite Fest organised as the first in a series of three kite fests that will continue in Alor Setar, Kedah and at Satun Island, Thailand. Besides the iconic head of the Angry Bird in bright red, the sky above Bukit Layang Layang was filled with giant balloon kites in the shape of a shark, a fish that resembled Nemo and a sting ray. The lunar year of the horse must be the inspiration behind the creation of a trio of flying horses! First time participant from Oregon, USA, Ron Bohart [Right] designed his kites with motifs inspired by his twin 9-year old grand-daughters and the native Red Indians. A serious kite enthusiast for just 10 years, Bohart uses the appliqué technique to piece together images and colors to create designs on his kite. He flew a kite shaped like a giant bunting anchored to the ground with 7,000 meters of rope and a smaller kite designed with the facial image of his pretty grand-daughters. Wang Fan [Centre] from Beijing, China, with his team mates and his intricately designed traditional Palace Lantern. He was among the international participants who joined a host of kite enthusiasts to give demonstrations of stunt kite flying during the event's official opening that was officiated by Sultan Ibrahim Sultan Iskandar on Feb 22. Johnny Yap and his team from Show Kites Singapore are no strangers to the kite fest as this is their sixth year of participation at Bukit Layang Layang. His team showed off their skills in flying 4-line revolution kites that made speedy revolutions as they soared to the skies and aligned in various patterns. While they are skilled in flying multi-line kites that soar at amazing speeds, Yap said that safety always comes first. Feb 22 was doubly special for German, Bernhard Dingwerth [Seated Right] not only because it was his first time at Bukit Layang Layang but also because he was celebrating his 59th birthday here. Inspired by the toys he saw when he was on holiday at the Canary Islands, he decided to create his kite as a trio of parrots. Dingwerth, who sewed his first kite some 31 years ago, was awarded Third prize for the Most Colourful Kite in the fest! For the last 25 years, Sami Sayegh from the Sky &Wind Kite Club in Lebanon has been keen about kites. Made from nylon fabric, his kite creation that fluttered merrily in the wind did not leave much to the viewers' imagination because it resembled three sperm making a futile attempt to fertilize an egg. He claimed in jest, that these creatures were white snakes from the mountains of Lebanon! I remember watching this movie, one of the highest grossing films of all time, about Elliot, a lonely 10-year old boy who longs for a friend and then befriends an extra-terrestrial or E.T. who is stranded on earth. While attempting to keep it hidden from his mother and the government, Elliot and his friends help E.T. find his way home. The scene that remains engraved in my mind is E.T. tucked in a basket, covered by a white sheet in Elliot’s bicycle as he and his biker friends outwitted the authorities on their BMX bicycles in an exciting chase. The most unforgettable part of the chase must be the point when the bikers faced a dead end and suddenly, E.T. used his telekinetic power to lift them into the air and fly away toward the forest. The friendship between a boy and an extra-terrestrial and the bikers’ skills in outrunning and outwitting adults on mere bicycles was especially inspirational to audiences worldwide. This movie made such an impact that youngsters wanted a BMX and cycling became popular again. Recently cycling made a comeback as a healthy hobby and my nephews and their friends are pursuing it quite seriously. On weekends, these cycling enthusiasts enjoy morning rides in Nusajaya and give themselves a breakfast treat on their way back to Johor Baru. These invigorating morning rides around Kota Iskandar at Nusajaya are fun especially when the roads are not only wider but less congested with vehicular traffic. When they shared their exciting experiences with Andrew, my nephew who’s also a cyclist enthusiast based in Perth, he couldn’t resist the thrill of joining them for a ride when he was next back in Johor. So when Andrew and his wife came home for Chinese New Year he also packed his bicycle and brought it along for that much anticipated ride to Nusajaya. We talked about their biking plans over our Reunion Dinner and as soon as the festivities were over, this group of cyclists went for a morning ride to Puteri Harbour (NST Streets Johor, Feb 6). This preliminary ride was just a warm-up for their next ride to Desaru which started from Taman Molek at 5am the following morning. The valiant riders took the necessary rest stops in their exhilarating ride but agreed that one of the most challenging stretches of the grueling trip must be the climb across the bridge near Teluk Sengat. Riding 80km to Desaru in more than four hours on their iron horses, was indeed an apt way to kick off the lunar Year of the Horse. From the many cyclists who frequent Nusajaya by day and at night, it is clear that the cycling phenomenon is getting big in Johor Baru. While vehicle drivers share the roads with the cyclists, I hope the authorities will seriously consider constructing cycling lanes or create cycling routes like the Park Connectors that exist in our neighbouring country. The lighting along the highways should also be improved for a more welcoming ambience in Nusajaya. Early last Saturday, our group of cyclists was riding in Nusajaya again and going by the Traders Hotel Puteri Harbour to an adjacent convenience store to top up their water bottles with isotonic drinks. They were disappointed that the store was not open yet and pleasantly surprised that their hesitation attracted the attention of a hotel concierge staff who approached them to offer help. 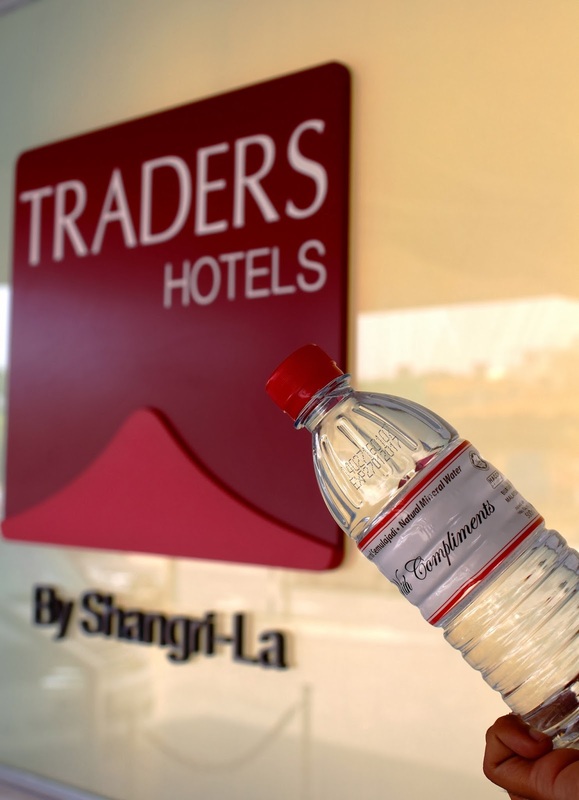 They asked him if there was any other convenience store nearby and when he said there was none, he promptly offered each one of them the hotel’s complimentary bottled water! 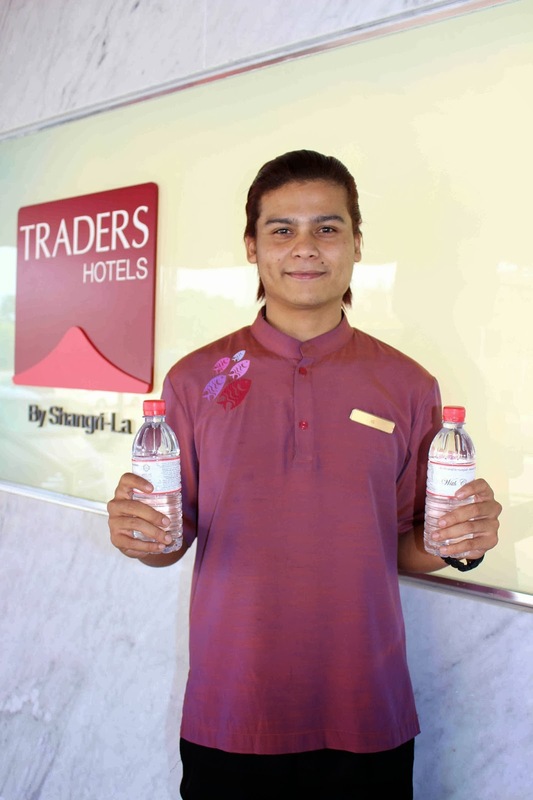 Such a random act of kindness by the hotel staff so impressed the thirsty cyclists that they wanted my friends at the hotel to commend such an exemplary staff who certainly reflected the hotel’s training in hospitality and encouragement to practice kindness at all times. He was alert and went beyond his call of duty to respond to the immediate need but even after his spontaneous response in this incident, people in that area cannot expect a ready supply of drinking water from the hotel. That is why I am urging the developers of Nusajaya to provide water fountains at bus stops and other strategic spots in Kota Iskandar for pedestrians and cyclists to quench their thirst and enhance their visit to this beautiful part of Johor Baru. On Sunday morning, 23 February, while I was on a media tour to experience the eco attractions at Kampung Sungai Melayu in Nusajaya, I met two cycling enthusiasts who were taking a refreshment break at the village corner coffee-shop. It was interesting to meet Teo Cherng Linn and his brother, Cherng Hann, weekend cyclists who enjoy exploring sites in Johor on their bikes. I learnt that they are from Pontian but live and work in Singapore now. And when they come to visit relatives who live in Bukit Indah, they will also plan a cycling tour in and around Johor Baru to rediscover the charms of Johor. For seven years Honey Nor Azizah Idris, 43, was glad that her annual health screening results were clear but in the eighth year it was discovered that she had stage III breast cancer. The news came as a tremendous shock and for more than a month, she was in denial and refused to do anything about it. After much persuasion, she went for consultation at Hospital Sultan Ismail and there, she met with a volunteer from the Breast Cancer Support Group (BCSG) Johor Baru who advised her to meet the members, many of whom are breast cancer survivors. She plucked up her courage to call the BCSG Careline and through the telephone she received the much needed encouragement and advice to start her own fight against the dreaded disease. In just two weeks, Honey Nor made the decision to go for her mastectomy and this was followed by a series of chemotherapy and radiotherapy treatments. With the support from her husband, two children and friends at BSCG, she embarked on the long road to recovery. After being declared cancer-free, she is able to return to her job as a sales promoter with a hypermarket. “I met BCSG members who looked so happy and positive even in their illness and I was deeply encouraged by their attitude and strong support,” said Honey Nor as she recalled her first visit to the BCSG centre, which was then located at Jalan Rengas in Melodies Garden. “I soon adopted their “I Can” attitude and went through my treatment with their practical and moral support,” she added. Honey Nor, now a survivor, joins the BCSG in regular hospital visits, outings and a range of recreational activities including swimming. Doris Boo, President of BCSG JB, herself a survivor for the past 16 years, is the driving force behind the team who plans and organizes activities to create awareness of what BCSG can offer to help patients and survivors achieve a better quality of life. Registered as a Non-Governmental Organization in March 2004, BCSG has annual campaigns to raise awareness of breast cancer and reduce the stigma of breast cancer, as well as promote education on the symptoms because early detection may lead to higher survival rates. Having experienced the pain and suffering, fear and anxieties as patients, BCSG members who are survivors are reaching out effectively to give hope to newly diagnosed patients and encourage them on their journey to wellness. Since 2006, the BCSG was meeting at their centre at Jalan Rengas in Melodies Garden, a property owned by Gan Sung Chet and his wife, who let them use it virtually free-of-charge. As the number of members and range of activities expanded, the premises became inadequate for group activities and this compelled BCSG to seek another site for their centre. Once they identified a property at nearby Jalan Ru, BCSG worked hard at a host of fund-raising activities including their Gift of Hope Charity Dinner in 2011, to raise funds to buy and renovate the building for their purpose. At 7am sharp on Feb 15, Tan Sri Dato’ Shahrir Abdul Samad, Member of Parliament for JB and patron of BCSG, with his wife Puan Sri Shahrizan, accompanied members and friends of BCSG for a morning walk from their old centre at Jalan Rengas to the new centre at Jalan Ru. It was a short but meaningful walk that symbolised their partnership in a journey together for the good of many who are going through the challenges of breast cancer and their battle for survival. The recently renovated centre was the site for a celebration of the joint effort and generous contribution from the office of Shahrir and big-hearted private enterprises and individuals. “I’m inspired by these brave survivors who are using their experience with the effects of cancer to become more positive about life, their relationships and position in the community,” said Shahrir as he toured the new centre. “This building is a proud testimony to what BCSG can achieve especially as it is helmed by survivors who are tenacious about sharing their hope with others,” he added. BCSG aims to use the new centre to continue with its regular activities in training survivors to guide others about Breast Self Examination (BSE), the proper use of prosthesis in a programme dubbed “Bosom Buddies”, post-surgery physical exercise as well as personal grooming in “Looking Good – Feeling Great.” A music room is designed for fun activities like karaoke singing and choir training while a Craft Shop is where members are guided to make useful handicrafts for sale. It has a wide side verandah ideal for outdoor activities and events such as cooking demonstrations and line dancing exercises. Several years ago, Lim Chuei Peng, 47, a nurse, was diagnosed with breast cancer and after she went through the treatment with the caring support of BCSG, she has joined the BCSG medical team in their effort to help others just as she was helped by them. Any visitor to Johor Baru will find Jalan Wong Ah Fook on the map because it’s the main road through the city named after Wong Ah Fook. Wong, a key personality in Johor history, developed close links with the Johor sultanate and established himself in building construction before gaining success as an influential entrepreneur in agriculture, gambling, banking and land development. As a carpenter-turned-builder and successful entrepreneur, Wong is credited for building the magnificent Istana Besar or Grand Palace, Istana Zahariah, Balai Zahariah and the Johor Baru Prison. 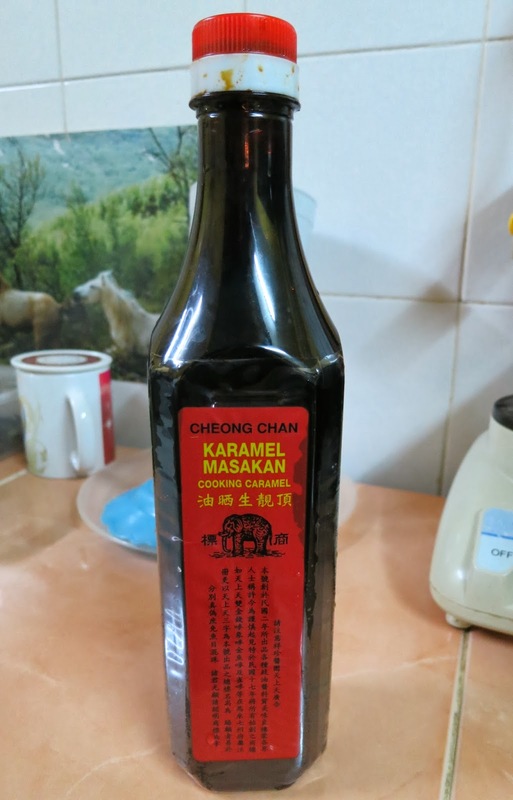 For 40 years, Wong held the position as president of the Johor Baru Kwong Siew Wai Kuan, the Cantonese clan association in JB which has its clan house at Jalan Siu Nam. Built in 1906, this double-storey shop-house donated by Wong was the traditional transit point for early immigrants who arrived in JB to get help with work opportunities and its upstairs was used as JB’s first Chinese school, a hospital and retirement home for immigrants who did not have families here. At their demise, these elderly immigrants were given traditional wakes in the funeral parlour on the ground floor of the next building. 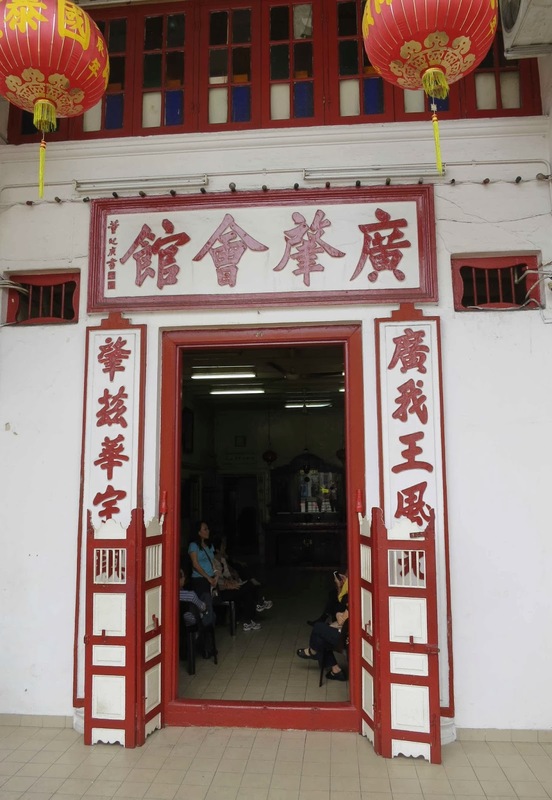 As the immigrants settled down in JB, the clan house changed its function to a meeting place and association office of the Cantonese clan here. 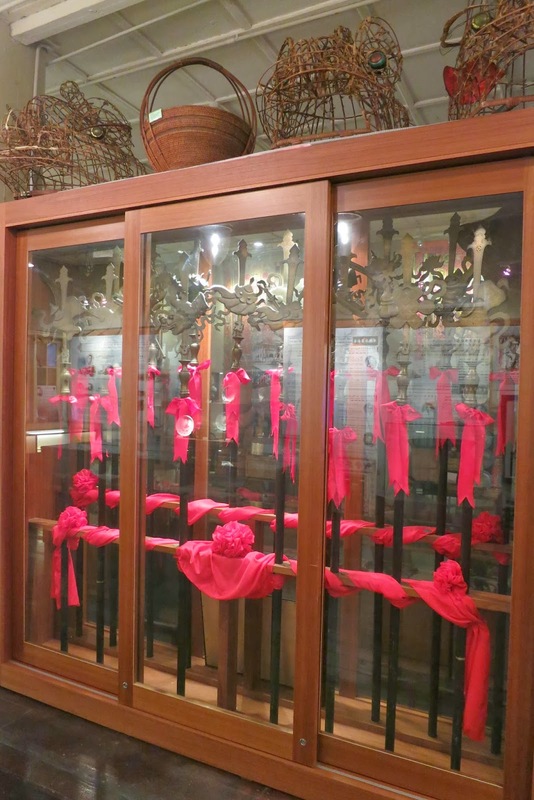 Over the years, a vast collection of artifacts was accumulated in the clan house and in 2008, Dr Cheng Chean Chiang, the current president of the association, initiated the setting up of the Johor Baru Kwong Siew Heritage Gallery there. With the help of Datin Patricia Lim Pui Huen, the great-grand-daughter of Wong Ah Fook, they opened the gallery to give visitors a better insight into the social life of Chinese immigrants and their role in the development of JB in the 1800s from virtually a jungle into a thriving township. Datin Pat, a professional historian, is the author of several historical books including, Wong Ah Fook - Immigrant, Builder and Entrepreneur (Times Editions 2002) and Johor – Local History, Local Landscapes 1855 to 1957 (Straits Times Press 2009). From her research and private collections, valuable information on maps, photos, posters and priceless artifacts were prepared and put up for display. In 2010 the gallery was officially declared open by former Johor Menteri Besar Dato’ Abdul Ghani Othman and with plans to showcase more exhibits, the adjacent corner unit of shop-house is currently being renovated to expand the gallery. There is a certain charm about visiting a heritage gallery that is housed inside its former clan house and if the walls could speak, you can imagine what tales it would tell. The front hall feels like a traditional ancestral hall as an entire wall is occupied by a Chinese altar and the air is filled with the fragrance of burning joss sticks. 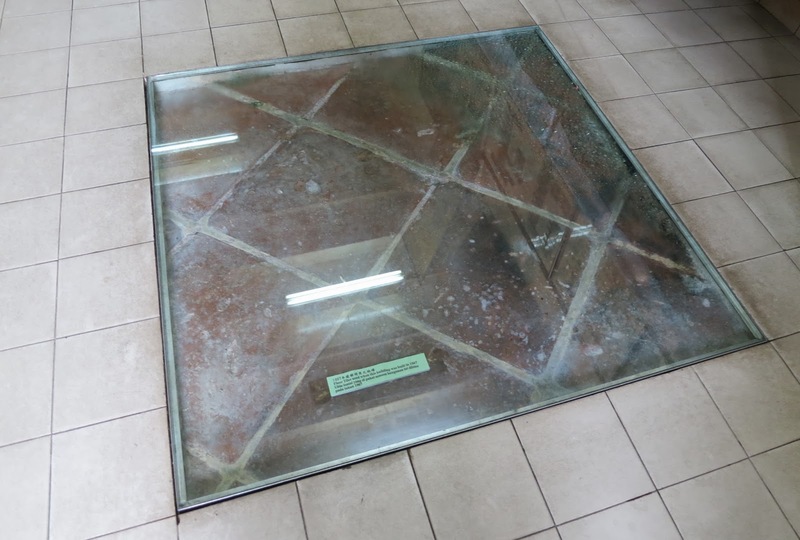 A portrait of Wong Ah Fook occupies a place of prominence on the wall and a section of the floor is preserved with the original floor tiles that were laid down in 1907. As Chinese immigrants prospered, Kampung Wong Ah Fook became the centre for leisure and entertainment, with clubs, restaurants, gambling houses, opium dens and brothels – vices that invariably follow immigrants wherever they settled – and secret society activities also flourished. At that time, gambling houses and opium dens were regarded as forms of investment and sources of much needed revenue in a developing town like JB. Opium smokers depended on the drug to work as rickshaw pullers or plantation workers to earn their fortune in JB, a new land traditionally known as, sun san (Cantonese) or sin sua (Teochew) which means, “new hill” and to send money back to support their families in the homeland. Among the interesting artifacts are a range of ancient musical instruments to play traditional Cantonese music, large ceramic bowls or phoot that were used to serve food to patients in their hospital, a collection of opium smoking paraphernalia and you can’t miss a huge urn used as an incense burner, that was donated by Wong Ah Fook’s opium company in 1891. In glass showcases you will see ceremonial items traditionally carried by the legendary Eight Immortals that were once paraded annually in the JB Chingay procession and also an ornately decorated traditional costume or kwa that Cantonese ladies used to wear on their wedding or grand birthday and kept aside to be worn for their burial. 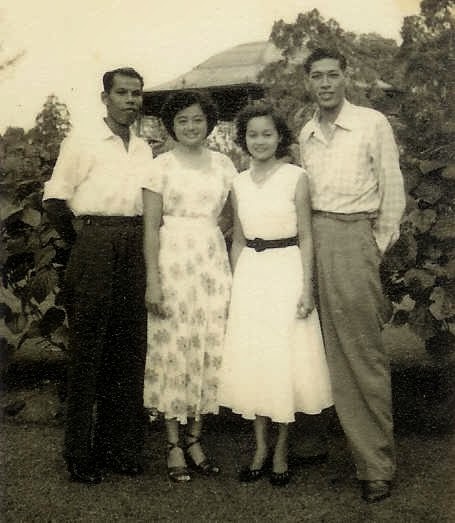 The early Cantonese community in JB, who were mostly involved in trades like goldsmiths and carpenters, certainly knew how to enjoy their leisure as seen from the priceless collection of old ticket stubs to Cathay and Broadway movie theatres and the infamous Tai Thean Kiew Circus. 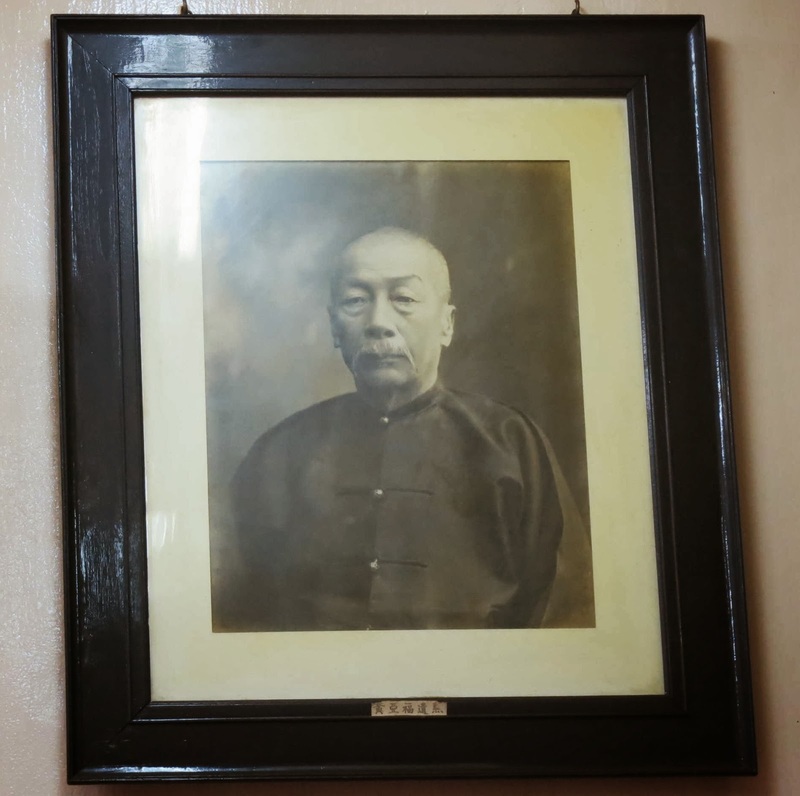 The gallery also records details on Yok Choy School, the first Chinese school in JB exclusively for the Cantonese community, founded by Wong Hee Coo and Luo Yu Sheng in 1907 that led to the founding of Foon Yew School in 1913 which was then opened to students from other dialect groups. Wong Ah Fook was appointed as Head of the School Board with Lim Ah Siang as his deputy while Wong Hee Coo held various important roles in the Board over 40 years. The school’s name, Foon Yew, is maintained in the Seiyap dialect in honour of Wong who was a Cantonese of Taishan origin and this school developed from such humble beginnings into a renowned educational institution that celebrated its 100th anniversary last year. While I’m sharing nostalgic childhood memories of Chinese New Year celebrations in Ah Kong or grandfather’s house (NST Jan 4), I’m also making new memories and starting new traditions in our family. With such hectic careers in our modern lifestyle, this annual break to return to our hometowns is a much anticipated trip not only for traditional Chinese but also for members of the extended family who live abroad or outstation. As some families are expanding with new members through marriage and births, it is also a bittersweet time when the absence of family members who have passed on in the previous year, is especially felt in this season of reunions. For families who are going through changes, the Chinese New Year is an opportunity to start new traditions and create new memories. Those who have suffered a recent bereavement still have to eat and they usually opt for low-key gatherings at home. This is also an excellent time for bonding and healing as the family comes together to carry on with established family traditions, cook familiar recipes and reminisce on past experiences with their deceased loved ones. As in all Chinese families, we maintain the tradition of visiting our elders and in the absence of our late Ah Kong, the home of Uncle Roland, our eldest uncle in Kota Tinggi is the first destination for our new year visits. Our visit usually includes a quick tour of his garden where he has a collection of orchids and fruit trees and visitors from the city cannot resist taking photos of his giant mangoes and auspicious pineapple plants or ong lai which literally means “good fortune comes,” in Hokkien and Teochew dialects. As my brother and his wife admired the banana trees, thinking of how our uncle will enjoy the fruits of his labour, they also had fun dancing Bollywood style around the trees! Two years ago, my brother and his family relocated to Kuala Lumpur for work and studies and we often tease them that they are now orang kay-el city folks. Every time they come back to Johor Baru, they head to their favourite street food vendors not only to satisfy their yearning for familiar comfort food but also to tah pau or pack as takeaways, and store in deep-freeze to take back to KL and savour it slowly whenever the craving arose. It is no different in this new year trip back as they even have orders to pack more portions for our cousins who returned to KL from Australia and the UK with similar cravings for JB street food! When I was a child, it was always fun to receive hong pau or red packets filled with lai see or fortune money and then tally up the total to find out how much I collected. 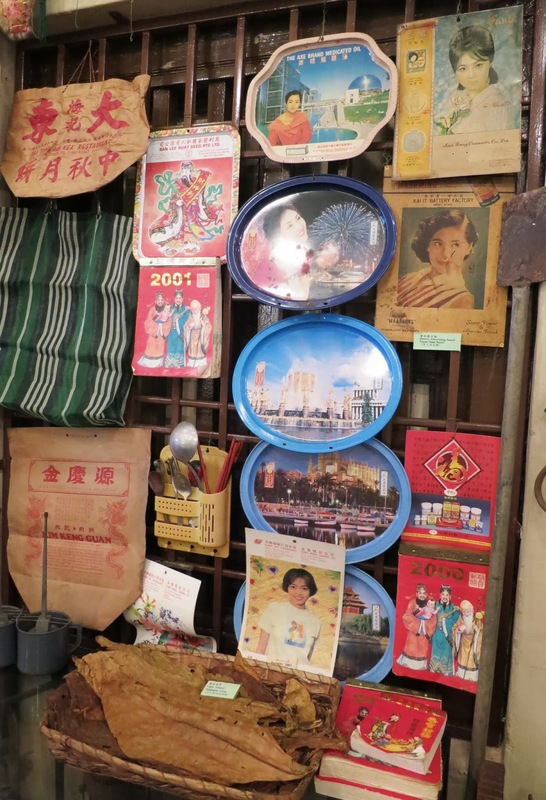 In those days, the only other money we received was our regular school pocket money so the annual hong pau money received was like a small windfall. 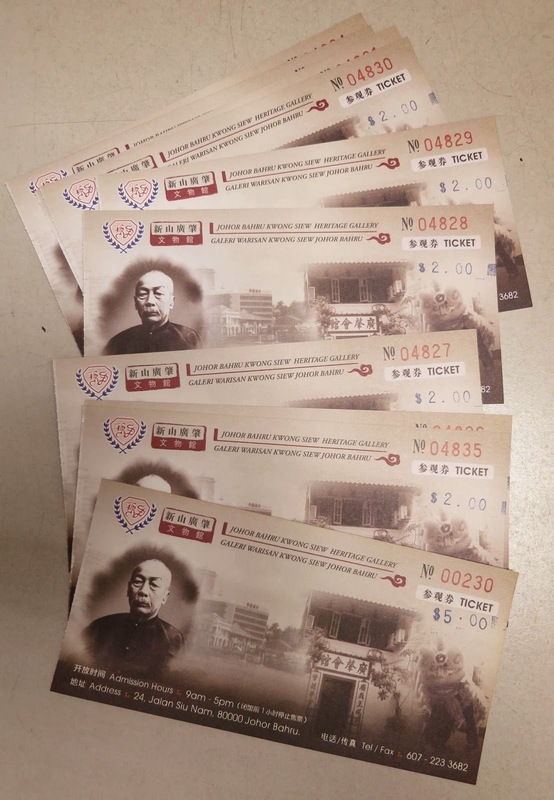 Our parents have post office savings accounts in each of our names and my siblings and I were encouraged to bank-in and save our hong pau money. As we grew older and could manage our money better, we were given the option to spend the sum on something we deeply desired instead of saving it. I soon learnt that it’s not the contents of the hong pau that matter but the Red colour of the paper packets that signify the giver’s wish to me for good fortune and success in studies or work. Over the years, the designs on the red packets have become so attractive and creative that I started a collection and now, every year I look forward to see new and interesting designs more than the contents of the hong pau. At Chinese New Year, we are overwhelmed by the colour Red as it is the traditional Chinese colour for good fortune. Orange colour has also earned its special place in Chinese traditions because the Chinese translation for the word orange is kum or “gold” which equates to wealth and good fortune. Mandarin oranges feature very prominently in this season and as a tradition, a pair of oranges is presented to the hosts in home visits to wish them good fortune and before you leave their house, they will reciprocate by presenting you with a pair of oranges to wish you the same. The Chinese New Year celebration is an opportunity for family reunions not only of the immediate family but also for members of the extended family to meet again at gatherings. Our family has a tradition to gather for dinner in a granduncle’s house in Johor Baru on the second day of the new year and this is where we can meet family members from Singapore and elsewhere because almost everyone will be there. As years pass and our elderly become less mobile and more dependent, it is up to younger family members to make the extra effort to ferry them to events such as this. It is important to get elderly family together and let them reminisce and talk and laugh about issues common among them to encourage them. 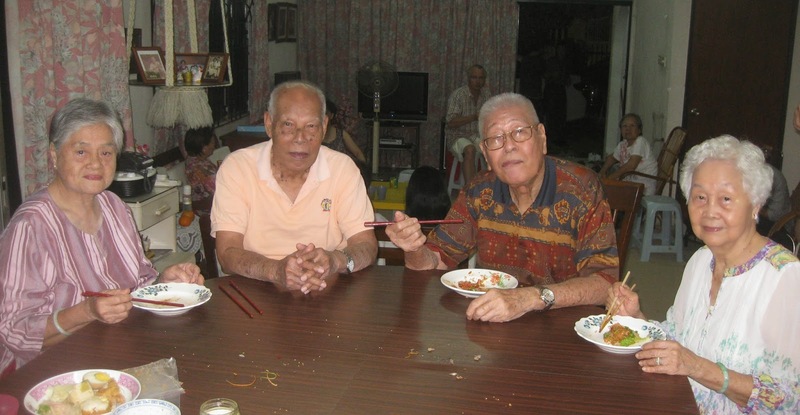 With deteriorating health and memory in their twilight years, such gatherings may even be the last time they can meet and interact with each other so I’m particularly pleased that my dad could share a laugh with granduncle Leong from Singapore. They share a happy history as they once enjoyed their dating days in the Istana Gardens way back when it was the most romantic place in Johor Baru and their girlfriends then are now my mum and my grandaunt! My nephew Andrew, who is based in Perth, is keen to make new memories this new year, and brought along two of his bicycles for a riding experience in Johor. He and a few fellow cycling enthusiasts took advantage of the festive break to enjoy the great outdoors of Johor Baru by bike and took a ride to Puteri Harbour as a preliminary exercise. The next morning at 5am, his ride that started from Taman Molek to Desaru took more than 4 hours, 3 tube changes, one wheel change plus a 12km "SOS" ride, for him to cover a treacherous 80km ride by the highway. With the support of a team of “marshals” who were just a phone call away, the valiant riders kicked off the Year of the Horse in a most memorable way with a ride to Desaru on their iron horses! Cycling is a healthy hobby that my nephews and their friends are pursuing quite seriously. On weekends, some of these young people go cycling in Nusajaya where the roads are not only wider but less congested with vehicular traffic. When they shared their exciting experiences with Andrew, my nephew who’s based in Perth, he couldn’t resist the thrill of joining them for a ride when he is next back in Johor. So when Andrew and his wife came home for Chinese New Year this year, he also packed his bicycle and brought it along for that much anticipated ride to Nusajaya. As soon as the new year festivities was over on the first weekend of February, the group of cycling enthusiasts got together for a ride to Puteri Harbour. After an energetic morning ride, they gave themselves a treat with a hearty breakfast at Trader’s Hotel Puteri Harbour. Now this was a preliminary ride as a warm-up for their next ride to Desaru. At 5am, before the crack of dawn the following morning, this group met in Taman Molek to start their ride to Desaru. In case of any emergency, a team of “marshals” followed by car to provide them with mechanical and physical support. The valiant riders took the necessary rest stops in their exhilarating ride but agreed that one of the most challenging stretches of the journey was the climb across the bridge near Teluk Sengat. After more than four hours, three tube changes, one wheel change plus a 12km “SOS” ride, Andrew completed his treacherous 80km ride to Desaru by the highway. Some family members came along to cheer on the riders as they pedaled their way on their iron horses. And when the riders arrived in Desaru, they still had energy for a frisbee game on the beach. After such a grueling morning, everyone deserved the reward of a sumptuous seafood lunch! Let me state for the record that I’m a great fan of food but I don’t cook. That’s why it’s always a pleasure to discover recipes, especially the ingredients in food that I fancy and experience the joy of tasting such food again – when someone prepares it for me! Whenever I recall food prepared by my grandma, her Teochew-style braised duck comes to mind. Married to a Teochew, grandma who is Cantonese has made this duck dish one of her signature dishes for festive occasions. I often mention it in my memories of Chinese New Year traditions in Ah Kong’s house and how everyone particularly enjoys her braised duck. I can recall an uncle who is Hokkien, referring to grandma’s braised duck as, lor ark, while grandma says lo arp, the Cantonese way. 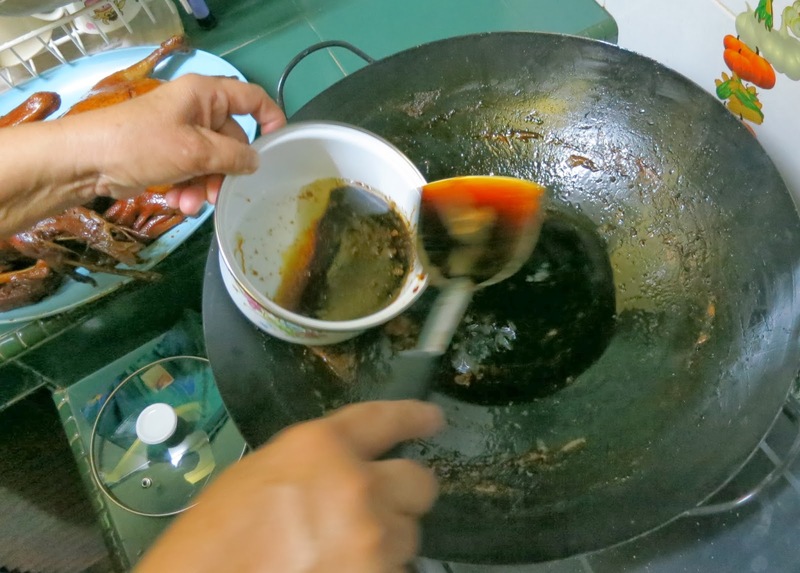 Grandma’s classic recipe is simple and the preparation rather straight-forward and I have seen her cooking a few ducks – one after another – in a gigantic wok for reunion dinners while we lived at No. 154 Jalan Ngee Heng. She was the master chef who did the cooking and finally, when the ducks were cooked and cooled, grandma would spread out sheets of newspaper on the floor before she sat down on a low stool and skillfully carved the ducks to present them beautifully on platters. The fragrance and flavour of grandma’s braised duck is certainly a comfort food that evokes fond memories of my growing-up years. At the start of the reunion dinner, the children will be served first and sent to sit at a table assigned to us [because the main table can only seat so many adults!] and I remember how mum would select tender pieces of breast meat drizzled with tasty gravy for me. Grandma’s simple recipe for a slightly, sweeter gravy has been handed down to her daughters and I’m glad my mum and aunty Polly, have mastered the finer points of making this delicious duck dish. First, clean the duck and pat it dry. 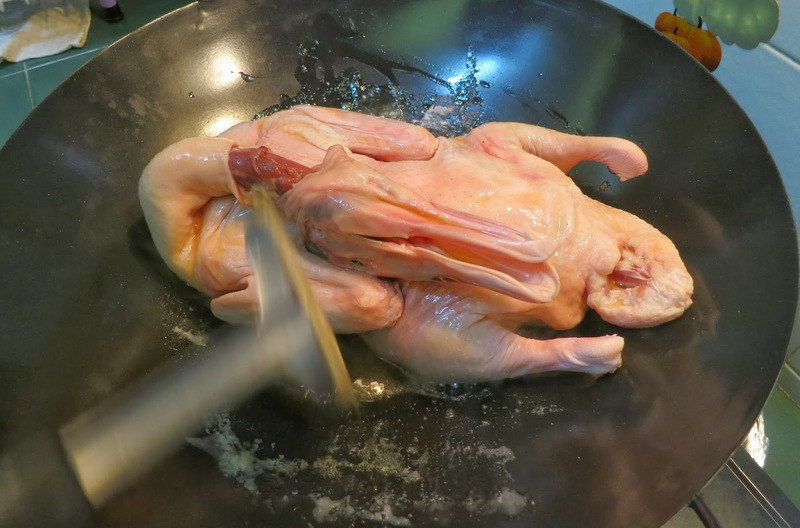 Then give the duck a good massage – inside and out – with salt and set it aside to marinade for at least two hours. Some recipes suggest marinating the duck overnight but as grandma usually makes a few ducks at a time, she had no space in the fridge to keep them overnight! 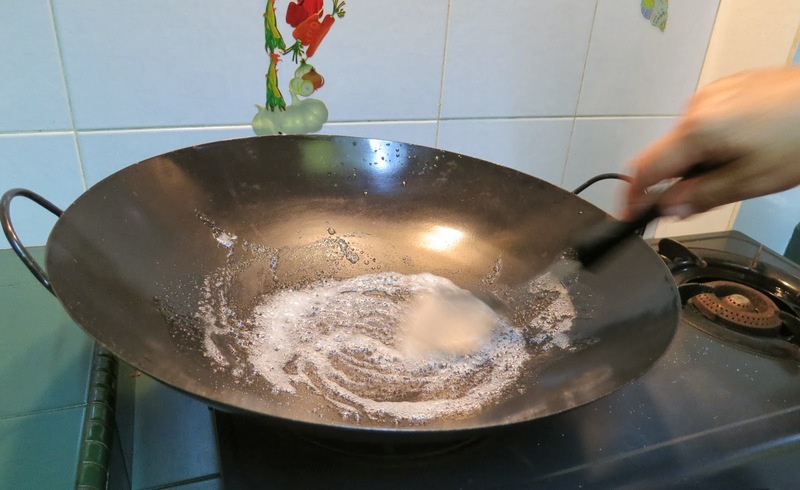 Warm up a wok– big enough to hold the size of your duck – in medium heat with three tablespoons of cooking oil. Add four tablespoons [or more!] sugar and stir until it has caramelized. 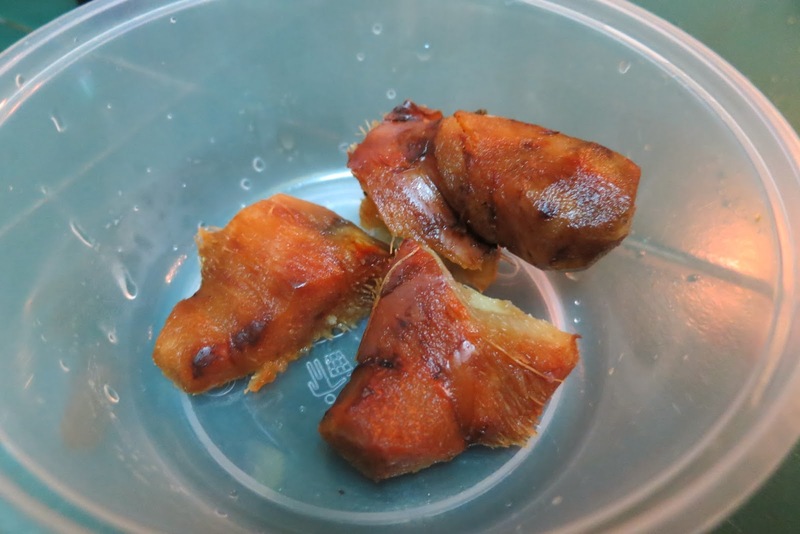 Prepare a few pieces of galangal [about 200 gm] and give it a smash before adding to the caramelized sugar. Some recipes include optional ingredients like star anise, cinnamon sticks and ground black pepper. Reduce heat to medium-low before gently putting the whole duck into the wok. Turn the duck over to baste it evenly. Put in thick dark cooking caramel sauce and add water to the mixture until it is half-way up the duck. Reduce to low heat, cover the duck and simmer for another hour and a half, making sure to turn the duck every 20 to 30 minutes. Keep an eye on the gravy level and turn regularly to avoid getting one side overcooked or burnt! Braise for up to two hours until the duck meat is tender and the gravy has thickened. Notice how the gravy has been absorbed by the meat! 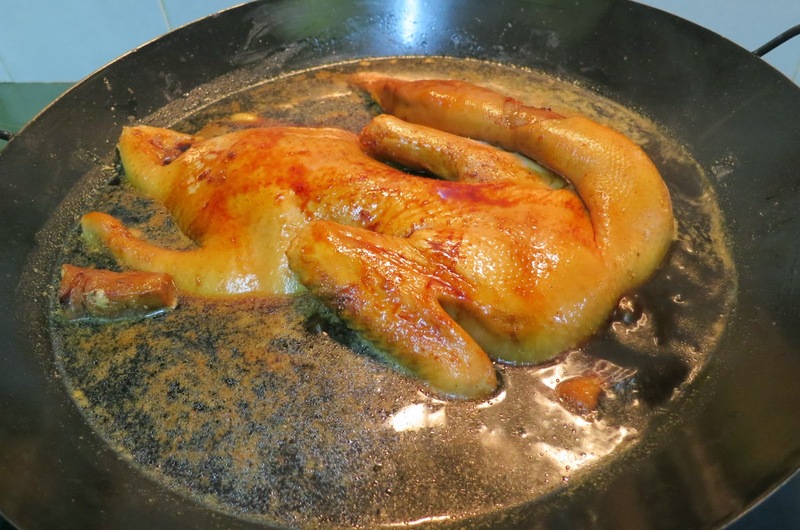 Test taste the gravy before turning off the heat and then remove the duck to set it aside to cool. Dish up the gravy and skim the surface to remove any excess oil. 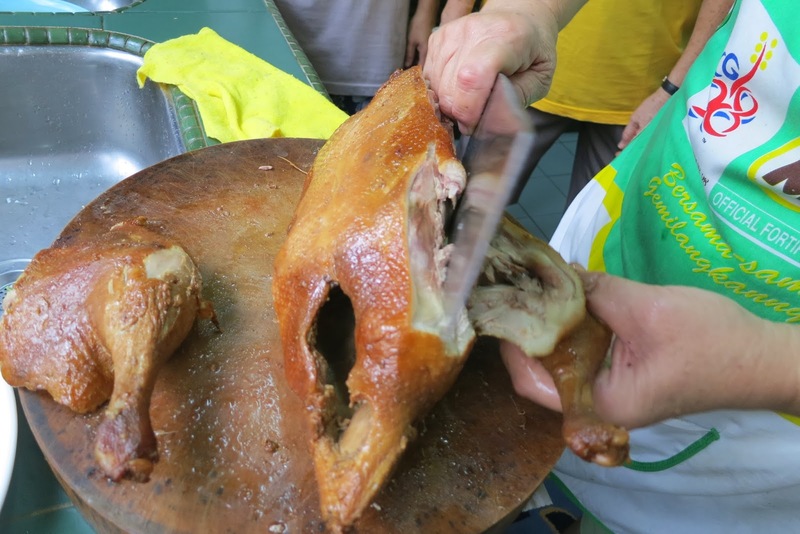 Let the whole duck cool properly before it is carved. Wear an apron [watch out for squirting juices and flying bits!] and wash your hands thoroughly before handling the duck, if you prefer not to wear gloves. 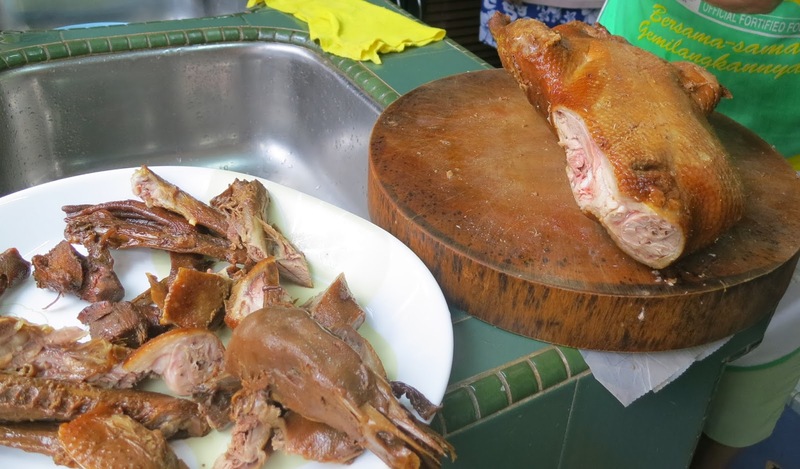 Remember there is also a method to carve and arrange the parts of a braised duck on a serving plate: Place its head, backbone and feet on the bottom layer of the plate before neatly arranging the cut slices on top. Warm up and drizzle some gravy on the duck before serving. 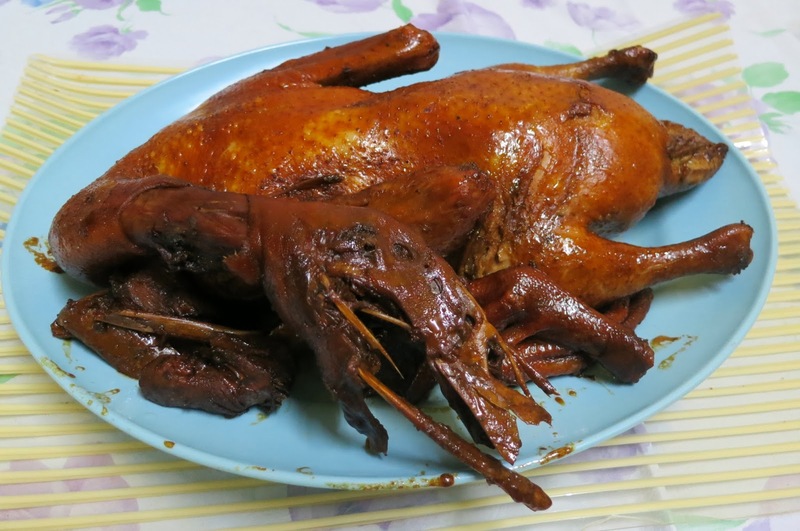 Teochew braised duck is distinguished by its sweetness and it’s up to you to add or reduce the seasoning according to the size of the duck and your individual taste. This method of preparation is not complicated but it may take amateurs a few tries before they achieve the desired gravy flavour and meat tenderness. And don’t forget that before you can serve your braised duck, you should also master the skills to carve it! When our schoolmates had a CNY gathering and each one brought a dish for the meal, my contribution was a whole Teochew braised duck. 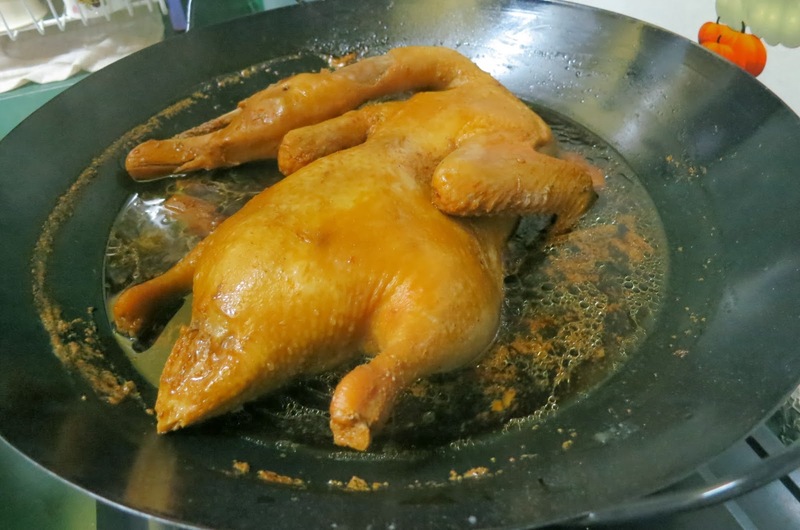 Irene – who is familiar with my grandma’s lor ark specialty – was thrilled with my duck and when I told her that I cooked it, she believed me. Later I revealed that it was actually bought and Irene was rather disappointed at how I led her on. Now Irene and I always have a laugh over our little lor ark joke!